Celtic should aim to "put the tie beyond Stjarnan" early in their Champions League qualifier, says former Celtic keeper Pat Bonner. Ronny Deila's side lead 2-0 from the first leg and will play Wednesday's return leg on an artificial surface. 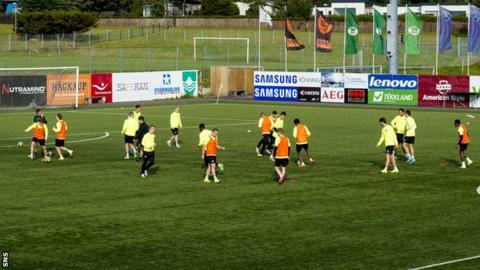 Bonner, part of the BBC Sportsound team in Iceland, said: "Celtic have to be professional and go out there full of confidence with no fears. "They will have to get the ball down and pass it." Bonner thinks the Stjornuvollur ground's surface will add to the challenge but remains confident Celtic will progress. "It's always difficult for teams and players to come off grass and play on astroturf," he said. "Nowadays, astroturf is normally in good condition; but this surface is four years old and will be well worn. "It will be difficult and Celtic. It will take them a little bit of time to get used to it." The leadership of captain Scott Brown - missing from the early Champions League qualifiers last season - and the return of defender Virgil van Dijk will boost their chances, Bonner added. "I expect them to score, but it will be tough," he said. "Icelandic players are always tough and they fight hard. "This team did create a couple of chances at the beginning of the second half; this time, Celtic can't afford to let them create any; they've got to take the game to them. "If they've got any type of chance, they'll keep going until the finish so Celtic need to put the tie beyond them in the first half and I think they'll do it." On the inclusion of new signing Nadir Ciftci despite his domestic six-match ban, Bonner said: "I expect him to play and I expect him to make an impact. "I think there's goals in him and that's why he has been bought." Former Celtic midfielder Paul Lambert thinks Ronny Deila will be better prepared for the Champions League campaign, having suffered an early exit last season shortly after becoming manager, and will realise its importance to the club's fans. "When you're a Celtic player, you have to qualify - the supporters demand that you get into the group," said the former Aston Villa boss. "They've got a good lead, but it's a dangerous lead, 2-0, but if they score again then Celtic will go through. "Hopefully, for the club itself, they do qualify. There's still a hard time to get through after this one. "For Celtic, it's important to do everything you can to try to qualify because you're not going to have another Old Firm game for another year. "The Champions League games will certainly help that."